FILE: UN Special Rapporteur on the Situation of Human Rights in Cambodia Rhona Smith speaks during a press conference at her main office in Phnom Penh, Cambodia, Wednesday, Oct. 19, 2016. Smith’s remarks followed a meeting with the president of the Cambodian Human Rights Committee (CHRC), Keo Remy. She told reporters after the meeting that she had not specifically discussed the fate of the opposition Cambodia National Rescue Party, which was dissolved by the Supreme Court in November after its leader was arrested on treason charges. “But I did discuss the need to have full rights of political participation in Cambodia, and for the views of the people who voted in the elections to be respected and recognized,” she said. Later, the Facebook account of the UN Office of the High Commissioner for Human Rights in Cambodia posted comments from Smith. “For many Cambodians who voted in 2013 and 2017 elections, their representatives’ seats are now occupied by those they didn’t vote for or even know. This raises serious concern about political participation rights. I also raised individual cases of particular concern,” she was quoted as saying. 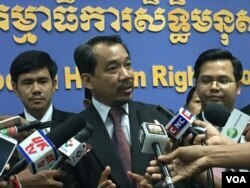 Remy of the CHRC told reporters that human rights issues could not impede the government’s plans for development of the country. “The duty of government is different from the duty of her role in defending human rights. The government rules one country. If we want to protect the majority of people, the millions of people, we must make a clear-cut decision, which would affect some corners. Particularly, we pushed for law enforcement,” he said. “I believe ... she misunderstood the government. But one day, she will be aware that the government is doing the right job. The most important thing is that when Cambodia gets things done rightly, you will understand what the government has done is right,” he added. On Wednesday, Smith also met You Ottara, vice president of the Supreme Court, with whom she reportedly raised the issue of judicial independence, the separation of powers, and the dissolution of the CNRP. Separately, Zeid Ra’ad Al Hussein, the high commissioner for human rights, on Wednesday said that he was seriously concerned by developments in Cambodia. 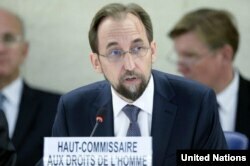 FILE: UN Human Rights Commissioner Zeid Ra’ad Al Hussein. Photo: UN/Jean-Marc Ferré. “Since this [Human Rights] Council last met, the Supreme Court has dissolved the principal opposition party, disenfranchising opposition voters. Recently adopted amendments to the Constitution and Criminal Code are likely to further erode political rights and fundamental freedoms,” he said. “I note and welcome recent improvements in social protection and the minimum wage, but I call on the Government to guarantee the political rights of the people, to respect the freedoms of expression, association and peaceful assembly, and to release human rights defenders and political actors,” he added.